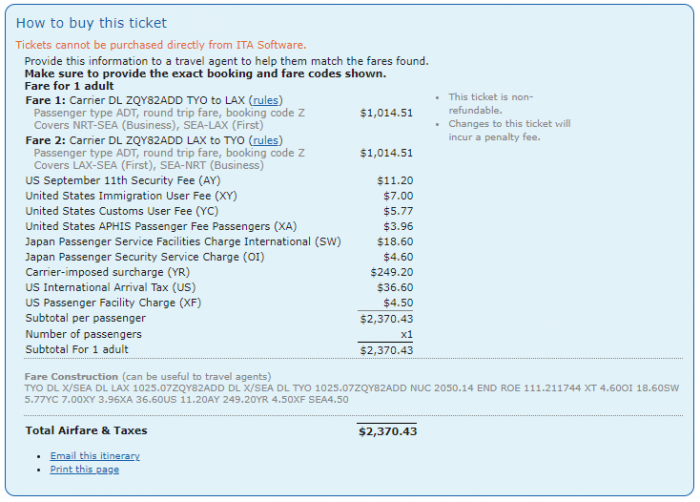 Fare: Delta (DL) ZQY82ADD TYO to LAX. Price: from $2,145 ($2,029 base fare + taxes & surcharges). Day/Time restrictions: outbound permitted Monday through Friday, Inbound permitted Sunday through Thursday. Seasonal restrictions: Outbound permitted 22DEC 18 through 28DEC 18. Inbound permitted 22DEC 18 through 01Jan 19. Flight restrictions: transpacific flights must be on any DL flight operated by DL/KE. Advanced reservation/Ticketing restrictions: reservation required 28 days before departure. Minimum stay requirements: 24 hours. Sales restrictions: Tickets must be issued on/before 08NOV 18. Cancellations: before departure charge 25% for cancel. After departure ticket is non-refundable. The following accruals were estimated using wheretocredit calculator for NRT-SEA-LAX round trip travel on DL marketed and operated flights without considering any elite status bonuses or ongoing promotions.